The largest recorded asteroid to enter Earth's elbow-room has passed by safely, with 2012 DA14 skimming through the geostationary orbit of our satellites at 17,450 miles per hour without leaving a scratch. The asteroid was observable with binoculars as it reached its closest point to Earth at 11:25am PST (7:25pm UTC) over Southeast Asia, and missed us by 17,150 miles (27,600 kilometers). The rock is 150 feet (45 meters) across and its 130,000 metric tons of mass are now heading out past the Moon. The asteroid was given a slight kink in its orbit by our close encounter, but Don Yeomans, head of NASA's Near-Earth Object program office, said that the tracking data is now in their computers and there would be no closer visits by 2012 DA14 for a generation or so. "It could make a close approach in 2046 but it cannot hit," he said. "Its orbit is now known so accurately that we can project through most of the 21st century. Right now we're looking at the very tiny possibility that it could hit the Earth in 2080, but I suspect that will go away and we'll know we're safe from this asteroid for a long time." According to robotic rock-hounds Deep Space Industries (DSI), the size of 2012 DA14 puts the asteroid's dollar-value in the twelve-figure range, with lots of valuable metals and liquids that could be harvested automatically and fired back to orbit around our planet to be used in orbiting manufacturing facilities. These could be just the thing for two California professors, who on Thursday proposed an orbital laser system which they call DE-STAR (Directed Energy Solar Targeting of Asteroids and exploRation). "This system is not some far-out idea from Star Trek," said Gary Hughes from California Polytechnic State University in a statement. "All the components of this system pretty much exist today. Maybe not quite at the scale that we'd need – scaling up would be the challenge – but the basic elements are all there and ready to go." The plans call for massive phased arrays of lasers powered by solar energy that could be fired at incoming targets. 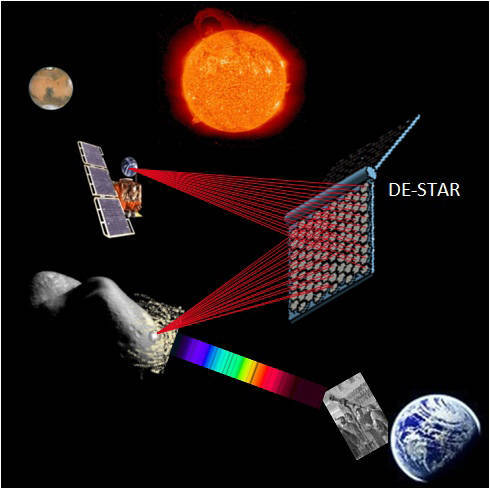 DE-STAR 2, which would be about the same size as the International Space Station, could deflect asteroids and comets, but the DE-STAR 4 plant, which would be 100 times as large, could send 1.4 megatons of energy per day to its target and vaporize an asteroid 500 meters across in one year, according to the professors' calculations. Maybe Star Fleet is the answer (Darth Vader would be strangling people with boredom with such puny weapons), since the DE-STAR team also suggests that the lasers could be used to power spacecraft around the Solar System via directed energy. An even larger facility called DE-STAR 6 could push a 10-ton spacecraft to near the speed of light, predicted professor Philip Lubin of the University of California at Santa Barbara. "Our proposal assumes a combination of baseline technology - where we are today – and where we almost certainly will be in the future, without asking for any miracles," he explained. "We've really tried to temper this with a realistic view of what we can do, and we approached it from that point of view," he said. "It does require very careful attention to a number of details, and it does require a will to do so, but it does not require a miracle."